There are several weapons all termed smallswords, and a definition is hard to pin down. Some variances were imposed by fashion, some by practicality and some by changes in the environment in which the weapon was used from the late 17th Century onwards. 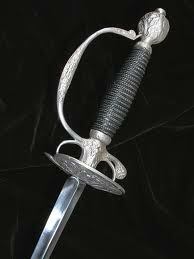 The smallsword was carried as a side arm by gentlemen and military officers, and was used for duelling and self-defence. Most swordsmen would choose to arm themselves with something more robust if battle threatened, but the smallsword could and did serve well at need. The smallsword is a light thrusting sword, with no edge. It has a fairly small handguard and a knuckle bow, and vestigial quillions at most. A very similar military weapon, the spadroon, did have an edge – but the smallsword usually did not. Examples varied from what were essentially light rapiers to predecessors of the modern fencing foil. Indeed, the foil was invented as a training tool for the smallsword, and derived much of its body of technique from the smallsword. The classical foil technique taught in modern ‘sport fencing’ classes is in most ways closely similar – though it is also very different in some instances – to smallsword technique. The competition-specific material which overlays this body of technique has little to do with the smallsword; sport fencing has evolved greatly since its roots as a salle exercise. Smallsword fencing also evolved, and over a longer period. It thus follows that different styles will vary significantly from one another – many early smallsword masters were rapier instructors adapting to the new weapon, while late era masters were operating in an era of repeating firearms where the sword was a sporting tool or social accessory as much as a weapon for combat. However, the principles of using a thrusting sword of a certain length remained the same throughout the period, and so there are many similarities between smallsword systems. In addition to a smaller and lighter blade, with no cutting edge, the smallsword lost the large protective hilt of the rapier in favour of a smaller, easier-to-carry design. The ricasso withered away along with the quillions, leaving just a vestigial version. A smallsword can be held in a sabre grip or a pinch grip, but in neither case are fingers put through the rings. Several of the historical masters are adamant on that point. The smaller, lighter smallsword was well suited to quick actions, but could be smashed aside (or just plain smashed) by a heavier sword. Thus a degree of finesse is required when fencing. A matchup between a smallsword and a heavier weapon is an interesting business which comes down to who makes a fatal mistake first. The aim of any smallsword fencer is to bring the matter (be it a salle bout, a duel, some kind of massed donnybrook with swords or a pitched battle) to an end on favourable terms. That usually means disabling, killing, disarming or discouraging the opponent, and possibly all of those, without coming to serious harm of any nature. Historically, this may include situations where killing the opponent is undesirable due to the social consequences, and therefore the means of ending the matter must be carefully selected. The key to defeating an opponent has often been stated as ‘to hit without being hit’, but it might better be said that the key is to do whatever it is you intend to do without coming to harm. A disarm can only be considered successful if the fencer does not receive a hit, for example. Thus the absolute first principle of smallsword fencing is not to be hit. To avoid being hit, fencers should only commit to an offensive action of their own when it is ‘safe’ to do so, i.e. they have created circumstances (or circumstances have occurred) in which the action can be undertaken with a low probability of being hit in return. Risks have to be taken, but they should be intelligently assessed rather than simply boring in and hoping for the best. Attacks and ripostes are, almost exclusively, made ‘in tempo’ or ‘in time’, i.e. at a time when the opponent is not attacking. The smallsword is largely a two-tempi weapon, i.e. normally a fencer will parry-then-riposte rather than attempting to land a stop hit with or without opposition. Such ‘contratempo’ actions are extremely risky but are sometimes used in conjunction with an evasion such as a void or leg slip. Attacks can be made direct, i.e. from an unengaged position directly to the target. It is likely that such a position must be obtained or ‘won’ immediately before attacking, as an opponent will probably not allow an unengaged situation to exist for long. It is dangerous for both parties to be uncovered in this manner. Direct attacks are common in the case of a parry followed by a riposte, as by definition a parry clears the opponent’s blade from the line of attack and opens the way for a direct thrust. Attacks can also be made indirect, i.e. with a disengage or cut-over to find an open or opening line. An indirect attack can be made as an initial offensive action or, less commonly (but highly useful against a skilled opponent who tends to parry direct ripostes) may be made on the riposte. An indirect attack typically begins from a 'closed' line, i.e. a position where the blades are engaged, and moves into an open or opening line at it progresses. An indirect attack may also be used to deceive a parry. In this case the attack is made into an open line and, as the opponent attempts to close this line the attacker disengages to deceive (avoid) the parry, continuing with the attack into an opening line. A feint or preparation of attack is often used to draw the parry, which is then deceived. In practice, most attacks are prepared in various ways. A beat or glissade on the opponent's blade will displace it and open a line of attack, or can be used to draw a parry which is then deceived by disengage. Sometimes all that is necessary is to change the engagement into an open line and thrust. To a great extent, smallsword fencing is all about the preparation; the attempt to obtain an open or opening line to thrust down. Those who just endlessly poke away tend to be defeated by those who know how to set up one clean attack. Simple defensive actions are intended to defeat simple attacks. In most cases the sword is used to defend with, though it is possible to parry with the off hand, to void the attack by moving off its line or to ‘defend with measure’ by moving out of reach. The problem with the latter is that an attack that falls short is still a threat if the opponent moves forward, and retreat creates no opportunity to riposte. Moving back with a parry is a useful way to gain time to complete the action against an opponent who is coming in deep or fast. On other occasions it is better to stand and parry, which results in the opponent being close enough for a riposte without a lunge. It is rarely a good idea to move forward while parrying, but sometimes it may be necessary to parry while moving forward! Circular, in which the blade moves in a circle around the opponent’s weapon, repositioning it to deflect the attack. In smallsword fencing the most likely attack is a thrust, though there is always the possibility of facing a cutting weapon in a mismatched encounter. The principle of defence is the same in all cases; to oppose the weak part (foible) of the opponent’s blade with the strong part (forte) of your own. When opposing a cut, say from a sabre, the parry needs to be pushed out a little wider than normal to absorb the blow, but with a thrust all that is necessary is to ‘defend the corners’. That is, if the shoulders and hips are considered the corners of the torso then it is only necessary to deflect the opponent’s thrust so that it passes outside them. There is no need (and it is not desirable) to make very wide parries; a thrust that narrowly misses to the outside is as successfully defended as one that goes past several feet away. He could push the weapon laterally across his body, causing it to miss down his left side. This places his hand in Quarte for a simple Quarte riposte. However, the blade is carried across the body and the point could end up reaching him before it is cleared. He could move his blade over the opponent’s in a semi-circular motion, placing his hand in Seconde. This deflects the opponent’s weapon down and to the right, but risks being hit in the leg or low flank before the weapon is cleared. He could move his blade in a circular motion around the incoming weapon, remaining in Tierce but now inside the attack, deflecting it high on his right. The main risk here is not getting around in time or being hit in the arm before the point is cleared. No parry is foolproof, and ‘universal parries’ put forward by some masters are not as effective as some would like to claim. In general, it is best to choose the parry that best ensures the fencer’s safety. If there is time to make any parry, then the one that best sets up the fencer’s favoured riposte should be chosen. In most parries, the opponent’s blade is engaged with the true edge, which gives a stronger hand position and reduces the chance of losing grip on the parrying weapon or having the parry pushed aside. Some parries use the false edge; this is entirely acceptable when parrying a thrust but is liable to result in a lost weapon if parrying a cut. The key points are to parry as late as possible, giving the opponent no time to change his intention and deceive the parry, and to parry just wide enough to defeat the attack. Well-controlled parries are essential to a successful riposte. Most ripostes are made direct, with an immediate straight thrust in whatever line the parry was made in. A lunge may or may not be needed to get the riposte to the target. If the fencer has moved back on the parry then the riposte will normally be made on the lunge. If the opponent lunges or moves in and does not retire, a simple thrust will suffice. As always, the fencer must judge whether or not to use footwork with the riposte, or if a thrust will suffice.